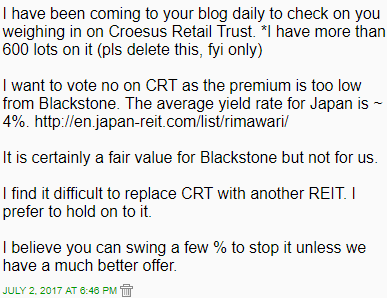 Vote for or against selling Croesus Retail Trust? For those who have been following my moves over the years, they would know that I got into Sabana REIT at depressed prices, collected dividends over a 3 year period and sold as its unit price retreated from a high on the back of various red flags. 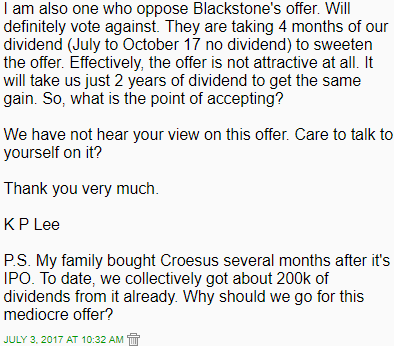 Getting into Croesus Retail Trust after its price retreated significantly from its post IPO euqhoria and also by taking advantage of the rights issues later, I am probably looking at a total return of between 70% to 100% for the investments made at different times. A few readers wrote to me, asking if I would vote against the sale and a couple of readers also asked that I mobilize my army of readers to vote against the sale. Alamak. AK is just another retail investor. AK is no king maker. So stressful. 1. With a DPU of about 8c, at 85c a unit, we were looking at a yield of 9.4%. At $1.17, we are looking at 6.8%. Yield has compressed by quite a fair bit. 2. Gearing is almost 50%, if I remember correctly. So, much of the yield we see is leveraged yield. If we should reduce leverage and that is possible through equity fund raising, distribution yield would drop. That makes for a fairer comparison against some retail S-REITs which have less than 40% in gearing. Now, if we remember, Saizen REIT was bought over at a premium of about 3% above NAV and that was when I thought Saizen REIT's properties were probably worth more than what was carried in the books too. Also, remember, Saizen REIT's gearing was much lower than 50%. 4. It is true that even a compressed distribution yield of 6.8% is higher than comparable J-REITs' yields but we have to remember that the rules governing J-REITs are different which was an important reason why Croesus Retail Trust decided to list in Singapore. If they were to list in Japan, their DPU and, consequently, their distribution yield would have been lower. Unfortunately, investors of Saizen REIT grew weary of waiting for value to be unlocked and agreed to its sale of assets. 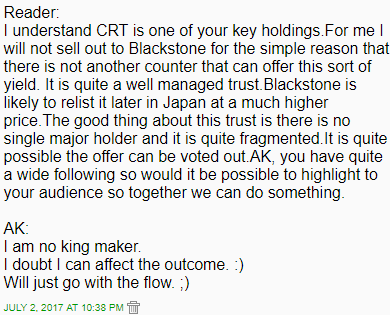 History with CRT and current thoughts. "I like what I see. So, I stay invested." Switching from one winner to another winner. No wonder you're a big name in the blogger investing world. Pei fu pei fu! i have been following since Tsunami. God of fortune always almost at your side. Not that it take away your credit though. Your selection mostly right. Since 2011? Wow. Time flies, doesn't it? May you please further elaborate what are the differences between J REIT and S REIT? the distribution of 4.06 cts is for the whole period from January 1st up to October 31st., 2017 ! This is effectively for 2 final quarters of FY17 PLUS one quarter and one month of FY18, and the dpu is only 4.06 cts ? Isn' t this too low ? 1) For Q1, Jul 1st till Sep 30th., 2016, the dpu was 1.79 cts. 2) For Q2, Oct 1st till Dec 31st., 2016, the dpu was 1.81 cts. 3) For Q3, Jan 1st till Mar 31st., 2017, the dpu declared but not paid out yet was 2.05 cts. 4) What about the dpu for Q4, Apr 1st till Jun 30th. ? Let' s assume the dpu amt is the same as per the previous qtr, ie 2 cts. 5) Then, what about the dpu for Q1 FY18, Jul 1st till Sep 30th., 2017 ? Again, let' s make an assumption here, ie similar with the previous quarter, = 2 cts. Hence, totalling up 3), 4) and 5) above (without taking nto account one more month of October, 2017), the estimated dpu payout should be around 6 cts, right ? Why is it only permitted to pay out only 4.06 cts (as the Permitted Distributions) ?????????? Thank you AK71. I appreciate your analysis on this. It is very readable, easy to understand. I agree with you. One reason is I can't find any alternative to CRT. so my vote is still no. Knowing that the result is likely to be majority approved for privatization, is it silly to still go and vote 'For' or 'Against'? My example will be CRT, I went to vote even though I'm just a small small unitholder. Forums seem to suggest 'why bother'? Think MMORPG... Bad AK! Bad AK!